If you haven’t visited Paris, you might assume that the pastry that best represents the city would be the croissant. After all, as Americans we associate the flaky pastry with the French even though it is technically a Viennese pastry. 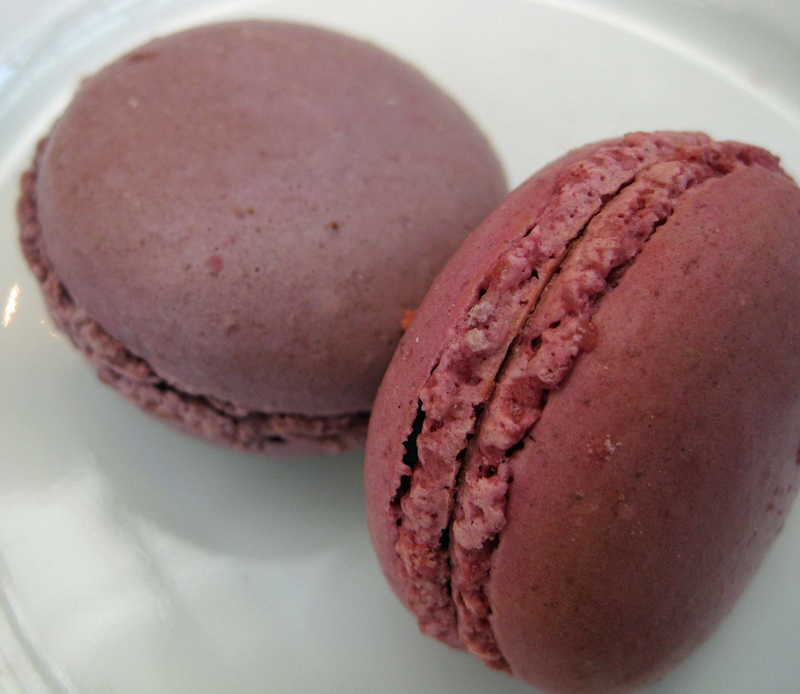 In our opinion, the pastry, or confection, that symbolizes Paris, and maybe even all of France, is the French macaroon. These beautiful cookies seem so sophisticated, yet are nothing more than colorful petite almond meringues filled with whatever the pastry chef can imagine; jams, caramel, pastry creams, whipped creams, are only a few of the things that can be smeared in between these light creations. If you’re a purist, you might add nothing at all. Walking around the streets of Paris you’ll notice that many shops specialize in one thing and one thing only. The fromagerie will not sell baguettes, and the boulangerie will not sell cheese. And many patisseries throughout Paris specialize in macaroons and that is their near singular focus. Walking into one of these shops with rows and rows of colorful dots reminds Jason of a George Seurat’s masterpiece not yet painted. Imagine the size and scope of Sunday Afternoon on the Island of La Grande Jatte created with tiny little macaroons in place of the dots of paint. Maybe George Seurat was influenced by these attractive, perfectly round, perfectly hued cookies. Born to a wealthy family and raised in Paris, he likely ate many of them. It’s fun to imagine his young eyes widening when he first sees the myriad color combinations created by the exotic palatte of the patisserie display case. Laduree macaroons served at Harvey Nicks. We first tasted a French style macaroon at Harvey Nichols. As fans of the BBC series Absolutely Fabulous, we had to lunch like Eddie and Patsy on our recent trip to London. Drinking wine and dining like the divas was one of the highlights of our trip. But, before stopping in for lunch at Harvey Nicks we toured the food halls of Harrods and visited the world famous Laduree teashop. When we saw the macaroons on the desert menu at Harvey Nicks we just had to finish our meal in style. Each of us indulged in a small, colorful piece of heaven. One bite of the cookie (there are only two bites per cookie) was all we needed to be hooked on the Parisian treat. Once in Paris we located Laduree’s flagship store on the Champs-Elysees. After selecting their grande cookies over the petites, a pistachio and a chocolate, we walked to the Arc de Triumph and climbed the stairs to the observation deck to watch the Eiffel Tower light show while secretly eating our cookies (secretly because food and drink are forbidden on the observation deck). All things Parisian were rolled into one glorious experience. C’est la bon vie! Upon returning to the states we’ve found a few little bakeries in San Francisco that make these beautiful little cookies. Jason made them once before, using almond paste, with modest success. Most of the recipes we have found call for almond meal or almond flour and in our opinion this approach seems to work better than almond paste. To truly get an authentic French macaroon you must grind the almond meal until very fine. Sending it through a fine sieve multiple times will get the best result. It is very time consuming and if you don’t have the right equipment it can take over your entire day, which means that sometimes you have to settle for the good over the perfect. You can still make a wonderful version of these cookies even if they are a little gritty from not getting the almond meal perfectly powdery. Think of them as country chic macaroons rather than the fussy, if perfect, Parisian variety. The recipe Jason uses comes from Martha Stewart’s June 2010 magazine and features a recipe by a baker in Colorado. The recipe seems pretty close to the ones we’ve found on-line that claim to be the authentic Laduree recipe. The filling he uses is an apricot preserve from a local San Francisco company called Jam. Jam’s Blenheim apricot jam is perfect for a light peach color macaroon, but any flavor of store bought or home-made jam, custard, or caramel will work wonderfully with the cookie recipe. So if you need a little taste of Paris don’t look for a croissant but instead try to find a little French macaroon. Of course, if you can’t find one in your local patisserie you can always make a small batch of them at home. My only variation from Martha Stewart’s recipe is with the pulsing and sifting of the confectioner’s sugar and almond flour. It can be difficult and time consuming to do this. If your almond flour is too gritty, don’t worry too much, just pulse as much as possible and if it’s taking too much time to sift it, just do your best. Some sieves are extra fine and sometimes it can be almost impossible to pass the flour through. They’ll still turn out wonderfully no matter how fine your almond flour becomes. Preheat oven to 375 degrees. Whisk whites with a mixer on medium speed until foamy. Add cream of tartar, and whisk until soft peaks form. Reduce speed to low, then add superfine sugar. Increase speed to high, and whisk until stiff peaks form, about 8 minutes. Sift flour mixture over whites, and fold until mixture is smooth and shiny. Transfer batter to a pastry bag fitted with a 1/2-inch plain round tip, and pipe 3/4-inch rounds 1 inch apart on parchment-lined baking sheets, dragging pastry tip to the side of rounds rather than forming peaks. Tap bottom of each sheet on work surface to release trapped air. Let stand at room temperature for 15 minutes. Reduce oven temperature to 325 degrees. Bake 1 sheet at a time, rotating halfway through, until macaroons are crisp and firm, about 10 minutes. After each batch, increase oven temperature to 375 degrees, heat for 5 minutes, then reduce to 325 degrees. Sandwich 2 same-size macaroons with 1 teaspoon jam. Serve immediately, or stack between layers of parchment, wrap in plastic, and freeze for up to 3 months. • Chocolate: Substitute 3 tablespoons unsweetened Dutch-process cocoa powder for 1/4 cup of the almond flour. • Coconut: Substitute 2 tablespoons desiccated unsweetened coconut for 2 tablespoons of the almond flour, and add 1/2 teaspoon rum; sprinkle with additional coconut before baking. • Peanut: Substitute an equal amount finely ground unsalted peanuts (peanut flour) for the almond flour. • Pistachio: Substitute 1/2 cup finely ground unsalted pistachios (pistachio flour) for 1/2 cup of the almond flour, and add 2 to 3 drops forest-green gel-paste food coloring. • Raspberry: Add 1 tablespoon fresh raspberry puree, strained, plus 3 to 4 drops dusty- rose gel-paste food coloring. • Vanilla Bean: Add 1/2 teaspoon pure vanilla extract or seeds from 1/2 vanilla bean, split and scraped, pod reserved for another use. • Coconut: 1 cup Swiss Meringue Buttercream, mixed with 1/3 cup angel-flake coconut. • Peanut: Chocolate Ganache, or store-bought dulce de leche, jam, or peanut butter. • Pistachio: 1 cup Swiss Meringue Buttercream, mixed with 1/3 cup finely chopped pistachios. • Vanilla Bean: 1 cup Pineapple Buttercream , 1 cup Swiss Meringue Buttercream, or 3/4 cup store-bought jam or preserves. « Older Post Tartine — The Sandwich	» Newer Post We Love Sandwiches! These look too perfect to be real!